A Woman Who Has Done Her Research! Summary: (from Goodreads) As a young man, Jacob Jankowski was tossed by fate onto a rickety train that was home to the Benzini Brothers Most Spectacular Show on Earth. It was the early part of the Great Depression, and for Jacob the circus was both his salvation and a living hell. A veterinary student just shy of a degree, he was put in charge of caring for the circus menagerie. It was there that he met Marlena, the beautiful equestrian star married to August, the charismatic but twisted animal trainer. And he met Rosie, an untrainable elephant who was the great gray hope for this third-rate traveling show. The bond that grew among this unlikely trio was ultimately their only hope for survival. Review: I read about a 1/3 part of the book when the movie came and it took me a looong time to finish just one chapter and it kinda killed me back then... I do not get it?! Now I have read it and the pages just flew along with the time. Sometime when I looked at the clock it was 5:30 AM. Luckily it has been holiday so it didn't have much damaged. I really like this book. The theme with circus and 1930's and it is an interesting setting. Actually there is two settings; the circus from the '30s and then there is in the present with 93 year old Jacob living in a nursing home. I am scared! I will never want to get old!! It seems so sad and depressing. I feel with Jacob and that's what makes it so great. 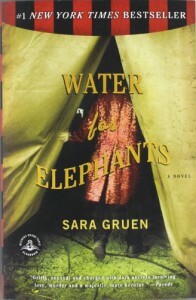 Gruen is really good to describe the settings - both the past and the present setting. You really get the impression that the author has done her research. Some of the details I really love. Hard to say why, but I do. My only but is, that the old Jacob has so much attitude where young Jacob is a little bit more... nah. He needs some more edge, but thankfully August helps it a bit. As much I feel with old Jacob as much do I hate August! Some things he do...I wanted to murder him!!! All in all. My impression is positive. I like it when the work has been done to every little detail and that is the feeling I get here. One thing is for sure. Next time circus is in town I have to buy a ticket!